A visit to the charming village of Zichron Yaakov, with its pedestrian-only cobblestone main street lit by old fashioned street lamps, and bounded on both sides with beautifully restored homes, courtyards, galleries, boutiques, and places of historical interest, will provide the visitor with a true understanding of Edmund de Rothschild’s vision and contribution to the Jewish re-settlement of The land of Israel at the end of the 19th century. No doubt your visit to Zichron Yaakov can be one of the highlights of your Israel trip. Several hours should be dedicated to your visit to Zichron Yaakov, especially if you plan to visit the First Aliyah Museum, tour the Aaransohn house, the Carmel Mizrahi or Tishbi winery and perhaps have lunch on the main street. As travel in Israel is relatively easy, the village can be reached within 45 minutes from Tel-Aviv or within 15 minutes from Haifa. Use Route 4 to enter Zichron Yaakov from the southwest and drive up the hill to Hakovshim St., and then turn left toward the circle, where you will again turn left in the direction of the arched entrance to Hameyasdim Street. You may find parking in front of the cemetery near the Founders’ Monument. The latter is a natural start to your walking tour and provides a brief historical sketch in ceramic relief. Here you can also pick up a map of the village as well as a list of restaurants and B&Bs. Then cross the street and enter the cemetery. The challenges that had faced Zichron Yaakov’s first settlers will quickly become evident as you walk through the cemetery noting the large number of children’s graves entombed above ground. The village was originally settled in 1882 by Zionist pioneers, predominantly from Romania, many of whose children perished from malaria or the hardships of the winter of 1883. Though some dispirited families chose to leave immediately thereafter, Edmund de Rothschild came to the rescue of the nascent community by providing agricultural employment and subsidized housing for his workers. The relationship between Rothschild’s administrators and these pioneers at times became acrimonious, in that the deeds to their homes had to be registered in the names of the administrators in return for Rothschild’s financial assistance. However, soon thereafter vineyards were planted and by the early 1890s a winery had become successful, providing the moshava with its financial footing. As you pass under the arch, note at number 18 the modest home of Asher Bonstein, a founding settler/farmer of Zichron Yaakov, and the collection of agricultural implements in the side yard of the homes at numbers 22 and 24.The Hershkovitch home is located further up Hameyasdim St. at number 30. Moshe Hershovitch, one of the original pioneers, was a master carpenter whose wood carvings survive in the synagogue as well as in the home of Aaron Aaronsohn. In his yard you will also find some of the mulberry bushes that were originally planted in 1900 to feed a population of silkworms. Silk manufacturing was yet another venture of the industrious Baron de Rothschild, yet short lived. Across the street from the Hershkovitz home at number 19 is the former home of the “foot pilgrim”. Chaim Bar Schwartz, one of the founders of Zichron Yaakov, was known to have fulfilled one of the biblical commandments, make pilgrimage to the Kotel or Western Wall of the Temple. One of the most notable buildings on Hameyasdim Street, with its stone, castle-like exterior and beautiful garden, is the Aaronsohn family home. As members of one of Zichron’s founding families, the wealthy senior Aaronsohns left Romania with their furniture, crystal and china, which is still on display at the home, as if the family had just sat down to a formal meal. The exploits of two of their children, Aaron Aaronsohn and his sister Sara have become legend in Israel. Aaron was a world-renowned botanist whose research at nearby Atlit led to his discovery of specimens of wild wheat known as “the Mother of wheat”. You may tour the home and the museum which contains an explanation of his scientific research, as well as many excellent documents, photographs and an audiovisual presentation relating to the role that Aaron, Sara and others played in the establishment of the espionage group NILI. Note: It is sometimes difficult to gain entrance expeditiously because of the many school children visiting the place. (06-6390120) A visit to the museum certainly merits a stop during your tour in Israel. Members of this group used NILI, an acronym for a biblical verse from the Book of Samuel, as a password. Their purpose was to help facilitate a British victory in World War I in Ottoman controlled Palestine by gathering intelligence on Turkish military installations and troop movements. The group used carrier pigeons to relay information to the British, but to the ring’s great detriment, one such pigeon decided to land at the home of the Turkish governor in Caesarea as it made its way from Atlit to British headquarters in Cairo Egypt. With the exposure of the espionage ring, Turkish authorities surrounded Zichron Yaakov and arrested members of the NILI group, including Sara Aaronsohn. Sara was brutally tortured by the Turks, but refused to divulge any information regarding the group. Asking to be returned to her home one last time to change her clothes, she went to the bathroom and shot herself, rather than giving the Turkish authorities the satisfaction of hanging her. 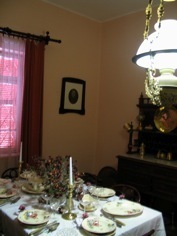 The pistol’s hiding place (known as a “slick”), and the bathroom can be visited on the tour of the home. Aaron, whose accomplishments also included the preparation of a detailed map of Palestine for use at the Versailles Peace Conference, mysteriously perished in an airplane accident over the English Channel in 1919. The remains of Avshalom Feinberg, another resident of Zichron Yaakov, and member of NILI, were discovered in the Sinai desert after the Six Day War. Beduins had murdered Avshalom during his attempt to reach Aaron Aaronsohn and the British in Cairo. At the time of his death he must have had a date in his pocket as a large date tree sprouted with his remains entwined in it’s roots. Bedouin tradition held that this tree was the resting place of the Jew. After the war, Avshalom Feinberg was returned to Israel and given a formal state funeral. Across the street from the Aaronsohn home you will note the restaurant/bar of the Tishbi family, with it’s comfortable outdoors seating area. The elegant stone house was originally the home of Shmuel Sternberg who designed the Carmel winery’s first iron gates. It was in the cellar of the Sternberg home that Shmuel’s son David hid Sara Aaronsohns’s final letter and will from the Turks. As you meander through the many shops and galleries make a point to stop at the water reservoir, known as Brechat Binyamin. At first glance you may think that the façade is that of an ancient synagogue, but the true purpose at the time of its construction in 1891 was to provide continuous flowing water to a central point in the village. The design of this otherwise utilitarian structure again reflects the careful planning undertaken by Rothschild’s administrators. Your next stop will be the synagogue at the corner of Hameyasdim and Hanadiv streets. The village was originally known as Zammarin, but to honor his father James, Edmund de Rothschild had the name of the village changed to “ In Memory of Jacob.” His Father’s name is further enshrined in the name of the town’s synagogue, Ohel Yaakov, which was built in 1886. The size and architectural quality of the Synagogue, with its elegant crystal chandeliers and richly carved furnishings, reflect Rothschild’s vision for the growth of the community and his main commercial enterprise, the winery. Immediately past the synagogue and opposite Rothschild Park stands the First Aliyah Museum (04-629-4777). The subject matter of this museum is unique, in that it focuses on the Aliyah from 1882 to 1904, rather than on the more frequently discussed subsequent waves of immigration to the Land of Israel. Spread over three floors of a building constructed in 1892, the museum presents a moving multi-media presentation of the travails of one family’s journey from the Diaspora to Palestine. Tracing the movement of a family unit is especially poignant, in that this Aliyah was comprised primarily of entire families escaping the pogroms of the East or those otherwise inspired by the opportunity to work the land. The video is supplemented by large photographs, sculptures depicting the First Aliyah’s pioneers and metal relief maps of sister villages of Zichron Yaakov built with the assistance of Edmund de Rothchild. 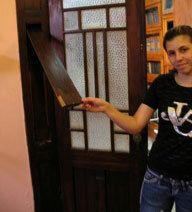 The museum is also a repository for one of the first movies filmed in Israel depicting life in Tel Aviv in 1913. 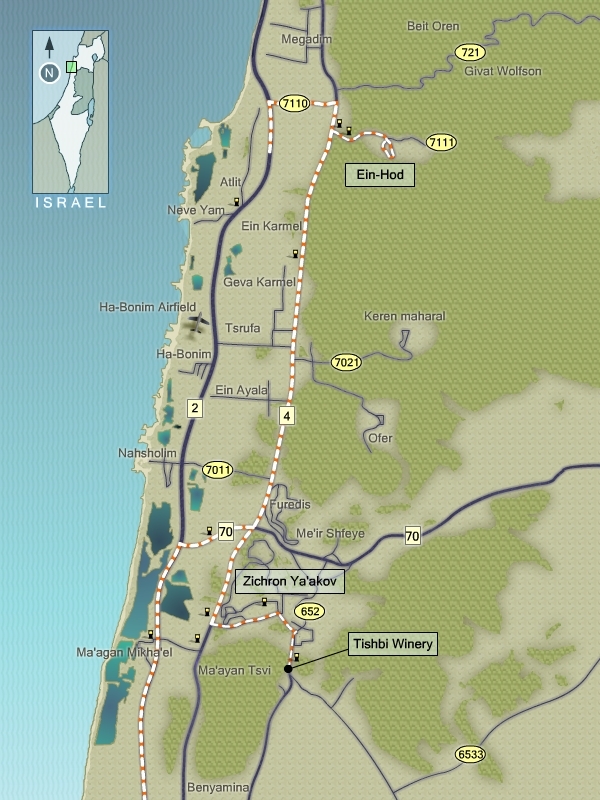 As you exit the museum, turn right into Hanadiv Street and proceed down the hill to the visitor’s center of the Carmel Mizrahi winery for a tour. If you previously visited the winery founded by Rothschild in Rishon Le Zion, you may instead wish to tour the smaller winery at the nearby Tishbi Estate (04- 638- 0435.) The Tishbi family was commissioned by Rothschild in 1882 to plant a vineyard near to Zichron Yaakov and they continue to be in business to this day. You may even find proprietors Johnathan and Nili Tishbi busily at work on the property. Their visitors’ center offers tours of the winery, a Kosher dairy restaurant, a wine and cheese shop, wine and chocolate tasting, as well as the ability to bring your own container from home for a fill up. The winery is unique in that much of its state-of the-art equipment is located outside for easy viewing. An exception of course is the oak barrel wine aging facility and the cognac plant, which utilizes a magnificent antique Remy Martin processor. The winery affords pleasant outdoor seating under a trellis and vines or at long wooden tables inside their modern/rustic style restaurant. The state of the art wine shop has an impressive collection of the large varieties of Tishbi wines, from their less expensive table wines to their estate collection. To reach the estate, follow the signs on Aahron Street, South of the Founders’ Monument, directing you toward Binyamina. 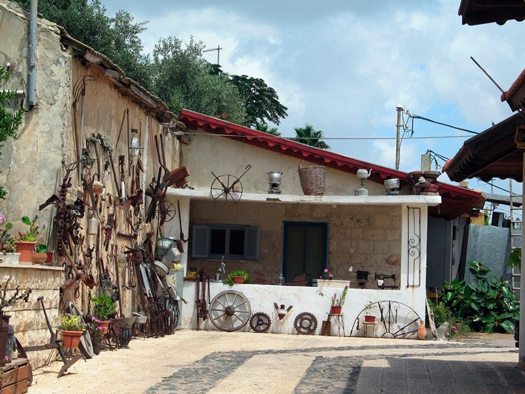 Return to Route 4 for the short drive in the direction of Haifa to the village of Ein Hod, which for art lovers is a must-see stop during their travel in Israel. Turn right at the Ein Hod/ Ein Hud sign that directs you up a winding road through the scenic foothills of the Carmel Mountains. 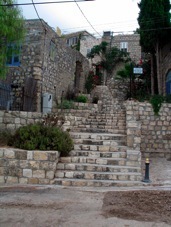 The village was founded in 1953 by Marcel Janko at the site of abandoned Arab homes in what was then known as Ein Hud. 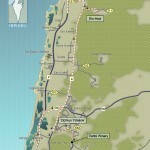 Because of its proximity to the main road connecting Tel-Aviv and Haifa, the villagers of Ein Hud were evacuated to higher ground during Israel’s War of Independence. Today, most of these former Arab residences have been reconstructed and enlarged, becoming home to a thriving artist colony. Try to avoid the crush of the weekend crowds to more fully enjoy meandering through the alleys, courtyards and in and out of artists’ studios. At the main square, across from the Dona Rosa Argentine restaurant, you will find a communal gallery displaying a sampling of the works of most of Ein Hod’s artists. Opposite is the Janko Dada Museum (04-984-2350), whose permanent display is dedicated to the seventy years of the artist’s world-renowned creations. Those of you with an adventurous artistic streak can try your hand at creating your own Dada masterpieces in the Dadlab interactive exhibition. If you care to enjoy more traditional, hands on artistic experiences, Ein Hod offers the visitor a number of interesting venues. Pottery making, including wheel techniques, glazing and kiln firing, can be studied with Naomi Verchovsky (04 984-1107). A demonstration of linoleum cutting, lithography and etching can be observed at the studio of Ora Lahau-Shaatiel (04 -984-2018). The studio of Helena Markson (04-984-1171) can offer you a glimpse into the world of printmaking techniques and etching on copper and zinc. After attending a workshop or just wandering through Ein Hod’s galleries, a brief stop for some homemade beer at the Art-Bar might be just what you may need on a hot summer day. There you will meet it’s colorful proprietor Danny Shlyfestone, who with his wife Analia, runs the mini brewery/art gallery. Danny serves a variety of stouts and ales, Yemenite style pizza is made on an outdoor Taboon on Fridays, and on Tuesday evenings it’s jazz from 6 p.m. onwards. If you stay long enough you’ll learn everything you ever wanted to know about the intricacies of beer making and the history of beer, with a few of Danny’s jokes thrown in between. Before you leave Ein Hod, ask Danny to point you in the direction of the Nisco Museum of Mechanical Music. Nisan Cohen will greet you at the door of his museum which is jam packed with his collection of music boxes, hurdy gurdies, an automatic organ, a reproducing player piano, and much more. No doubt, one of the more unusual attractions in Israel! Cohen, a native of New York, spent a lifetime as a documentary filmmaker while collecting music boxes and accumulating a vast archive of Yiddish records. One of his most prized possessions is the 1918 rendition of Hatikva on the Edison label, which he will play for you on an original RCA windup gramophone. Also, if you are visiting Ein Hod on a Friday, you can attend the 1 p.m. concert presented at the Nisco Museum using Cohen’s original mechanical instruments. However, you may wish to call first as the concert is dependent on the number of guests attending.(052-4755-313). At the conclusion of your visit you can return down the hill to Route 4. Turn right, and at the sign, left towards Atlit where you can rejoin Route 2 toward Tel-Aviv. There is a podcast available for this post. To listen to it now click this link. If you would like to download it, right click the link and select the appropriate download option.